Welcome DEALERS to PONDMASTER SERVICE, Your Official Pondmaster sales and service center for helping your customers either Repair or Replace their out of WARRANTY Pondmaster Products. Here you have three choices. 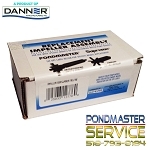 You can either direct your customer to us if they wish to repair or replace their OUT of WARRANTY PondMaster Product. To qualify for dealer pricing you must call in your first order and be prepared to present your credentials. You must submit at least three forms of business ID. An active E.I.N #, your businesses Brick and Mortars address, and a verifiable business Checking or Credit Card account. All orders are pre-paid unless proper paperwork and Credit applications are received and approved. Two orders must first be received with prepayment and a Dealer account must be set-up with your first called in order. Call Us At 518-793-8184 TO PLACE YOUR FIRST ORDER.